Designed for large engines including HGV’s, tractors, heavy plant and other commercial vehicles. 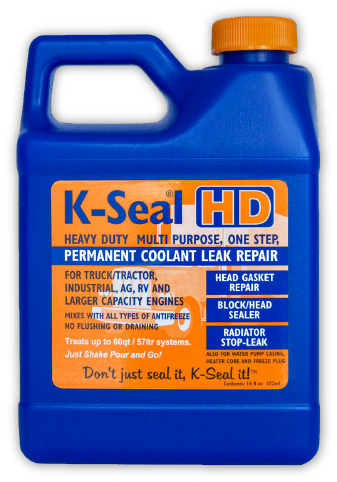 Avoid costly repair bills and downtime with K-Seal HD K5516 Coolant Leak Repair; the simple, permanent solution to cooling system leaks. K-Seal HD fixes most leaks in water-cooled engines and is designed specifically for HGVs, tractors, heavy plant and other commercial vehicles. It is compatible with all coolant system additives and kinds of antifreeze, meaning you can use K-Seal HD with confidence at all times. With K-Seal HD there’s no need to take a commercial vehicle off the road – just apply and run the engine as normal. K-Seal HD’s scientifically-tested formula, containing ceramic microfibers and copper particles, will seek out cracks and holes and provide a guaranteed repair for the lifetime of the engine. I put this in my 2005 Cadillac XLR and fixed the issue, I am so happy. It was going to be $3500 by the local dealer to rebuild the engine, and how knows If that would have fixed it. What a product. K-Seal HD can be used in the workshop, on-site, and even on the road. K-Seal HD’s unique formula can be used in hot or cold engines, simply by shaking the bottle and pouring the fluid into your vehicle’s radiator or header / expansion tank. K-Seal HD will circulate harmlessly within your engine’s coolant until it locates a crack or hole, where it will coagulate and cure, forming a permanent seal. There’s no need to flush or clean your cooling system after use – just run your engine as normal. Important Please use extreme caution when working on a hot cooling system as hot coolant and gases could cause injury. If in doubt please consult a qualified mechanic. Copyright © 2019 K-Seal International Ltd. All rights reserved.